To get to the truth, Clay Blair interviewed scores of skippers, staff officers, and code breakers, and combed thousands of documents and personal papers. In addition, he thoroughly researched the development of the submarine and torpedo from pre-war to post-war times. 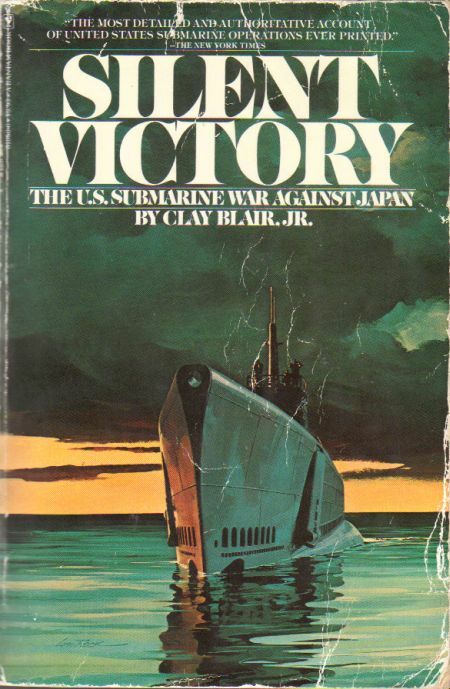 As a result, he takes the reader into the submarine war at all levels?the highest strategy sessions in Washington, the terrifying moments in subs at the bottom of the ocean waiting out exploding depth charges, the zany efforts of a crew coaxing a chicken to lay an egg. He also exposes the reader to the jealous infighting of admirals vying for power and the problems between cautious older skippers and daring young commanders. Supplementing the text are nearly forty maps showing submarine activity in the context of every important naval engagement in the Pacific, more than thirty pages of photographs, multiple appendixes (including a calendar of submarine war patrols), and an index of over 2,000 entries. This is a work of great scholarship and scope that makes a timeless contribution to the history of World War II. 1975 trade size paperback. Well read copy with wear to cover and some pages. Text is unmarked.